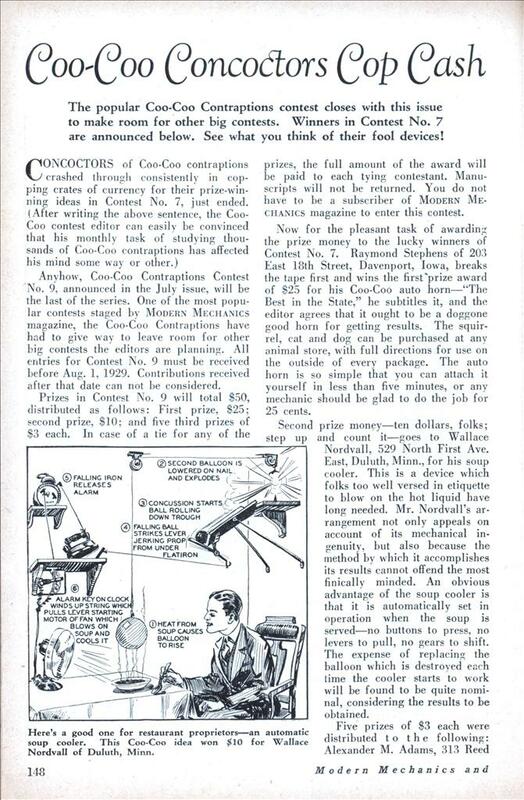 The popular Coo-Coo Contraptions contest closes with this issue to make room for other big contests. Winners in Contest No. 7 are announced below. See what you think of their fool devices! CONCOCTORS of Coo-Coo contraptions crashed through consistently in copping crates of currency for their prize-winning ideas in Contest No. 7, just ended. (After writing the above sentence, the Coo-Coo contest editor can easily be convinced that his monthly task of studying thousands of Coo-Coo contraptions has affected his mind some way or other.) Anyhow, Coo-Coo Contraptions Contest No. 9, announced in the July issue, will be the last of the series. 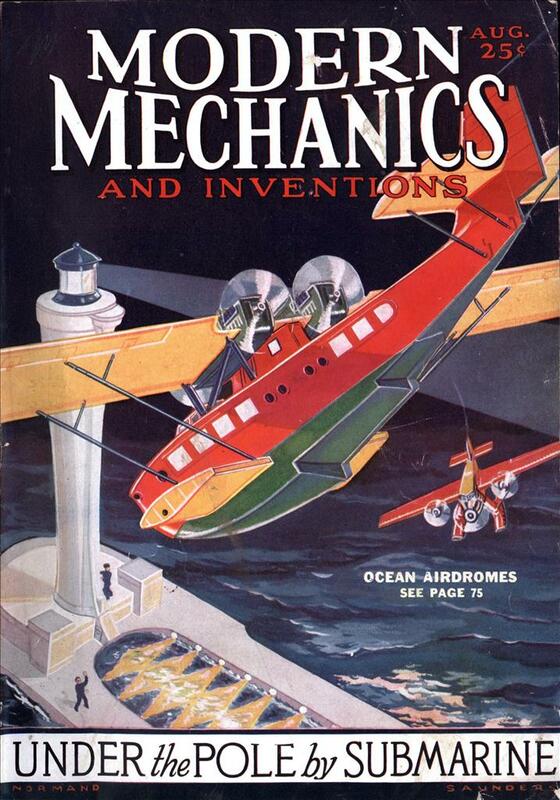 One of the most popular contests staged by Modern Mechanics magazine, the Coo-Coo Contraptions have had to give way to leave room for other big contests the editors are planning. All entries for Contest No. 9 must be received before Aug. 1, 1929. Contributions received after that date can not be considered. Prizes in Contest No. 9 will total $50, distributed as follows: First prize, $25; second prize, $10; and five third prizes of $3 each. In case of a tie for any of the prizes, the full amount of the award will be paid to each tying contestant. Manuscripts will not be returned. You do not have to be a subscriber of Modern Mechanics magazine to enter this contest. Now for the pleasant task of awarding the prize money to the lucky winners of Contest No. 7. Raymond Stephens of 203 East 18th Street, Davenport, Iowa, breaks the tape first and wins the first prize award of $25 for his Coo-Coo auto horn—”The Best in the State,” he subtitles it, and the editor agrees that it ought to be a doggone good horn for getting results. The squirrel, cat and dog can be purchased at any animal store, with full directions for use on the outside of every package. The auto horn is so simple that you can attach it yourself in less than five minutes, or any mechanic should be glad to do the job for 25 cents. Second prize money—ten dollars, folks; step up and count it—goes to Wallace Nordvall, 529 North First Ave.
East, Duluth, Minn., for his soup cooler. This is a device which folks too well versed in etiquette to blow on the hot liquid have long needed. Mr. Nordvall’s arrangement not only appeals on account of its mechanical ingenuity, but also because the method by which it accomplishes its results cannot offend the most finically minded. An obvious advantage of the soup cooler is that it is automatically set in operation when the soup is served—no buttons to press, no levers to pull, no gears to shift. The expense of replacing the balloon which is destroyed each time the cooler starts to work will be found to be quite nominal, considering the results to be obtained. Five prizes of $3 each were distributed to the following: Alexander M. Adams, 313 Reed Street, Clearfield, Penn., for his Patent Mouse Eradicator; E. G. Machauer, 1033 Jena Street, New Orleans, La., for his Traffic Violator Signal; Albert Bushell, 3671 Pt. Grey Road, Vancouver, B. C., for his Self-Watering Flower Pot; A. T. Abbott, Jr., Trevett, Maine, for his Fool-Proof Thief Frightener; and F. N. Sebaut, 804 Seventh Street, N. E., Canton, Ohio, for his Cigaret Lighter. To all of these prize winners, and to the hundreds of others whose contraptions just failed to place “in the money,” the Coo-Coo Editor extends his sincerest congratulations on the ingenuity displayed. Coo-Coo Contraptioning seems to be the popular American sport, judging from the entries which roll into this office every month. In submitting your entry to the final contest, No. 9, which closes Aug. 1, bear in mind that the simpler and funnier your coo-coo idea is, the better its chance of winning a prize. Involved and long drawn out arrangements are not what is desired. Try to design your contraption so that it can be drawn compactly in one picture by our artists. The first prize winner on this page will give you a good idea of what is wanted. It is not necessary for you to make a finished drawing of your invention unless you so desire, although a sketch will be helpful if you can enclose one. A clearly written explanation of how your idea works is essential. Let’s make this concluding contest the best one yet. Sharpen your pencils, fans, and get busy! These inventions seem perfectly sensible to me.